The AlumLock is a high security seal that is flexible and adjustable consisting of a cable that pull through to a desired position and permanently locks in place. They are available with different cable diameters to secure various applications with different security requirement. The Bullet Polyhex Cable Seal is very user friendly and highly tamper evident. It has six plate and all of them could marking. One end of the cable is permanently secured via crimping technology which cannot be removed without cutting the cable. The IronFasten Cable Seal is secured by turning the provided shear bolt until it securely locks the cable in place. The shaft of the shear bolt breaks when it has secured the cable completely. 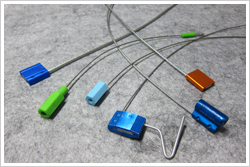 It is more cost-effective compared to other cable seals. The Mini Polyhex Cable Seal is very user friendly and highly tamper evident. It has six plate and all of them could marking.